Street artists have faced arrest, persecution, exile, and banishment in the face of their work. And it has never stopped them. Established street artist Invader cited the death penalty as the only threat capable of ceasing his ‘invasion’. So how has an art form rooted in dissent and globally recognized as a criminal offense become an enthusiastically sought after commodity sold across the world for millions of dollars? The cultural shift that occurred in the past century is an incredible phenomenon that has lead to a wide spread obsession with street art. Artists that began their careers illegally tagging trains are now equated with fine art and found in museums, galleries, and auctioned off at Sotheby’s and Christie’s. Even so, anonymity continues to play a large role in the street art scene, a reminder of an illicit and rebellious past. Invader, who has been carrying out a large-scale project called Space Invaders since 1998, continues to work under an alias. His project comprises the illegal plastering of pixilated mosaics in 77 cities and counting and has indeed met resistance. A gallery owner that worked with the artist spent two weeks in jail, and Invader himself is banned from a number of countries. However illegal, today his works are worth upwards of $100,000. Contested, arrested, and copied, illegal art is ironically sold in legal auctions and is now admired and studied by many. Controversial from its creation, street art continuously pushes boundaries. 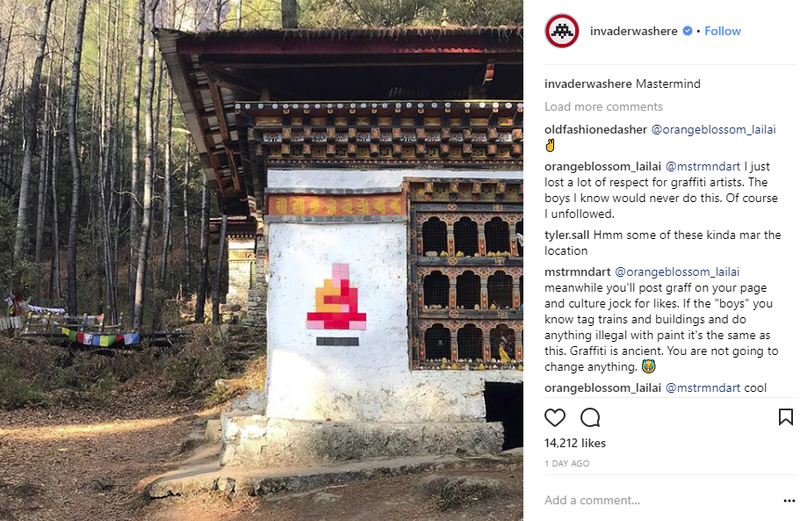 This past January Invader made a trip to Bhutan, where he plastered his mosaics onto historic and sacred sites such as Cheri Goemba, Bhutan’s first monastery. The video he posted to his Instagram account enraged some but inspired others. His audience remains split despite Invader’s claims that he had “the blessing of the monks,” and was asked by the chief monk to install the work on site.The incident caused many to ponder their own moral and ethical boundaries and sparked discussions around art, space and place, and our relationship and responsibility to our surroundings. It is precisely the ability to engender such debate that is at the core of street art, and in the words of French street artist Zevs, “a work of art without a core will only survive a short period...”Zevs is widely known for his Liquidation series in which he paints over institutional logos, causing them to melt and dissolve right before our eyes. An early member of the growing graffiti scene, Zevs was arrested in Hong Kong for spray-painting a Chanel logo onto a Giorgio Armani store. Yet, he refers to his artistic experience in Hong Kong as “one of the most intense experiences thus far in [his] career.” He compares the experience to a game of chess. The King Chanel and Queen Armani were his opponents in a fight that was set across the entire city of Hong Kong.Compelled to prove to a judge that his actions were artistic and not criminal, the experience was a pivotal one that forced the artist to question his own artistic motives. As a kid, he was almost crushed by a train while writing in a dark railway tunnel; the train was code-named Zevs. Arrest and near-death experiences have not hindered the artist but have motivated him. Indeed, despite his six-week stint in a Hong Kong jail, his works ironically sold at Sotheby’s in Hong Kong for upwards of $30,000 in 2016.Zevs continues to fuse a street art disposition with Pop Art-like appropriations of popular culture to simultaneously highlight and undermine the power of consumer culture. His art forces society to confront its relationship to art and consumption in an ironic and unusual way. By using a company’s logo against itself, he is at once acknowledging their power and attempting to strip it away. Zevs opens up a dialogue between big business and consumer, between society and our own deeply rooted obsessions and forces us to question them. 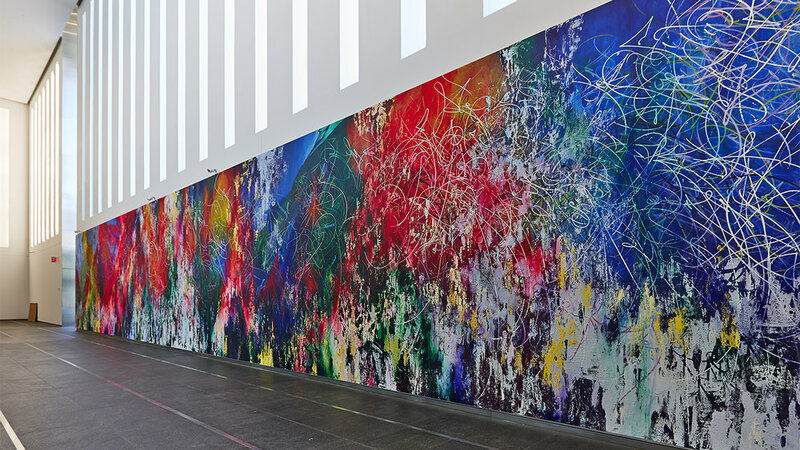 Communication to provoke thought and change, this idea is central to other artists such as José Parlá, Vhils and Zhang Dali. Parlá, the son of Cuban immigrants, was a graffiti artist by the nickname Ease in Miami when one of his high school teachers recognized his talent. He went on to study at the Savannah College of Art and Design and is best known for his monumental calligraphic abstractions, including a large mural that welcomes visitors to New York City’s One World Trade Center. His art is a reflection of the ephemeral layers of urban space, showing what has been and what has become, bringing the past into the present. His One World Trade Center mural, entitled ONE: Union of the Senses, is a large-scale symbol of diversity and unity. It is at once a celebration of life and a reminder of our past, encouraging communication and diplomatic conversation to incite change. In another exchange of past and present, artist Vhils dissects the history and memory that our lives are built on. He destroys in an act of creativity that facilitates change and open dialogue. Alexandre Farto, known as Vhils, has been a prolific graffiti writer since the early to mid 2000s. He was raised in Portugal during a time deeply affected by revolution and the destruction he witnessed would inspire his creations in later years. Vhils works by carving into walls, exposing the various layers underneath. He is widely known for his relief portraits, which utilize the patina of a city’s history in order to create a work of art that straddles past and present. By chipping away at the surface, he unveils the history and culture hidden beneath. The result is an image that once again raises questions and begins a conversation around identity, life in a contemporary metropolis, and our relationship to these spaces and the history buried within them. Like Vhils and Parlá utilize history and change to engender discussion and progress, artist Zhang Dali uses his work to comment on that ways in which the urban space has morphed the human experience. His earlier Dialogue & Demolitionseries from the late 1990s in Beijing comprises of a spray-painted silhouette often accompanied by his tag, AK-47, and/or a cutout of the silhouette which tears through the wall itself and exposes the city behind it. The cut out highlights the construction and destruction of a city in constant flux. Acting as a stand in for the artist himself, the silhouette allows the artist to be in continuous conversation with the space and those who come into contact with it. The title of his series emphasizes the colloquial intent of the series, meant to engage its audience in a meaningful dialogue with their surroundings. Zhang’s relationship to the city itself is complex, as he was forced to flee Beijing following the Tiananmen Square protests of 1989. Fleeing to Italy, he returned in 1993 and shortly after began this series. Intersections of history, dissections of culture, a conversation between time and experience, street art has a captivating power to engage a wide and global audience in important discussions that transcend time and inform on the future. The unorthodox career paths that the majority of these artists take are an illustration of the unprecedented inclusivity that defines street art. Shepard Fairey was attending the Rhode Island School of Design when, inspired by skateboard culture, he had an idea to start a sticker campaign. Cited as an experiment in phenomenology, the sticker campaign is meant to stimulate curiosity, to bring people to question both the sticker and their surroundings on a larger level. Bearing the word, OBEY, the sticker itself has no actual meaning but rather takes on a different interpretation with each individual who comes into contact with it. The OBEY campaign continues today, even though Fairey himself is well known for other ventures. During the 2008 election Fairey created a poster of Obama with the word ‘Hope’ that exploded and became a symbol for the future president. The poster also elevated Fairey out of the skateboard and street art scene and into a global sphere. He has since used his platform to speak on more political matters and encourages others to raise their voices as well. Fairey’s call for a more progressive and hopeful future contrasts perfectly with the ominous work of Cleon Peterson. Peterson’s work draws on an aesthetic reminiscent of classical Greco-Roman vases while depicting the violence and terror that is present in contemporary society. Using a style that hearkens back to the ancients, Peterson brings history forward, reminding us that without intervention history will only repeat itself. It is through action that we achieve progress and through silence that we regress. Peterson’s most recent body of work, Blood and Soil, takes its name from a Nazi slogan used to instill fear and to silence opposition, similar to contemporary political tactics of weaponized fear that manipulate people today. His work from this series, such as Little Man Big Man Putinbluntly attacks the Trump administration and American politics, confronting modern day concerns and forcing viewers to acknowledge the issues that are directly in front of them. From mosaics to spray-paint, destruction, creation, stickers, and straightforward illustrations of contemporary fear, these artists have risen to prominence from a variety of backgrounds, from cities all across the globe, and have risked arrest, exile, and banishment for their daring artworks. Once viewed as criminals tagging the streets and disrupting the status quo, this disruption is welcome today like a long lost friend. They offer critical commentary and incite vital conversations, and the value of their work is more widely understood and celebrated as scholars dedicate their lives to the promotion and education of street art. Today Invader, Zevs, José Parlá, Vhils, Zhang Dali, Shepard Fairey, and Cleon Peterson are admired instead of hunted, praised instead of imprisoned, studied instead of scorned, and find themselves facing an audience eager to listen, eager to discuss, and even more eager to collect.